Modbus to BACnet gateways, or protocol converters, translate Modbus registers into BACnet objects, and translate BACnet objects into Modbus registers. The Babel Buster gateways will connect Modbus RTU or Modbus TCP devices to a BACnet IP or BACnet MS/TP network. The Babel Buster gateways will also connect BACnet IP or BACnet MS/TP devices to a Modbus RTU or Modbus TCP network. 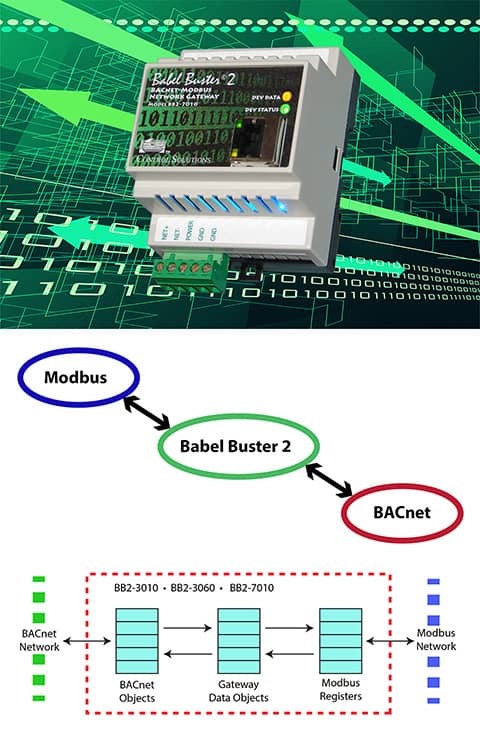 The Babel Buster gateway functions as a Modbus to BACnet protocol translator. Data will generally end up being the same on either end, but the details of how it is transmitted on the network are different. In the case of Babel Buster gateways, you also have the option of applying data conversions on the fly to do things like apply units conversions or convert integer to floating point. The Babel Buster gateway will automatically poll registers or objects according to rules you set up using a simple user friendly template. Copies of data retrieved by this polling are saved within the gateway, and other devices may then poll the Babel Buster to retrieve that data. Therefore, as an example, data from a Modbus holding register may be read as a BACnet Analog Input object. If the Modbus holding register is mapped to a BACnet Value object, then data flow can be bidirectional on either network. The Modbus to BACnet gateways may be used to connect Modbus devices to a BACnet network, or connect BACnet devices to a Modbus network. A Modbus to BACnet gateway and a BACnet to Modbus gateway are going to be basically the same thing and you will use the same gateway model numbers either way. How you refer to this translation is a little like picking a street and then talking about whether you are driving north or south. All of the Babel Buster gateways that support both Modbus and BACnet protocols are capable of functioning as Modbus master or slave, and BACnet client or server. Except for Modbus RTU, the gateways can be master and slave (or client and server) at the same time. Modbus RTU requires selecting one or the other, and the user makes this choice.